Content: There’s a bit of mushy love stuff, but it’s fairly understated. It’s in the YA section (grades 6-8) of the bookstore. I spent the review the last time I read this talking about the characters and how they’re what really matters when reading this series. And that’s true. Tiffany Aching wouldn’t not be Tiffany without the other witches, like Nanny Ogg or Granny Weatherwax or Annagramma or Petulia, or without Roland or the Nac Mac Feegle. Or the Chalk. But, what stuck with me was not the characters (perhaps because I’m reading all these one right after another) but the plot. Basically, Tiffany disrupts the seasons when she gets impulsive during the winter dance and joins in. 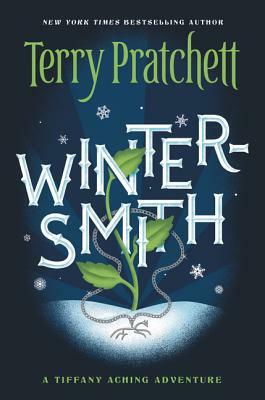 The Wintersmith, the elemental who runs winter, is intrigued and decides that he needs to woo Tiffany. Which, because he’s Winter, involves a lot of ice and snow and cold weather. And because of this, spring is delayed. Tiffany has taken on the role of Summer in this dance, and has to figure out how to get out of it. Before the cold starts killing animals and people. I loved the way Pratchett was playing with Old Stories, with mythology. I loved the way Tiffany had to take responsibility for things, even though it was impulsive and she didn’t “mean” to. This time, I enjoyed what it was about as much as the journey. This series is just so great. I love the Tiffany Aching books! They are by far my favorite Discworld novels.